Use the Speaking Engagement Contract for providing speaking services for a fee. This agreement covers compensation, ownership of recordings, liability, warranty and other details. Proposal Kit it has really made my business easier to manage. I have been using them since 2016 and they are very easy to use. I use the Contract Pack and Proposal Pack Wizard and no problems at all. Overall a good 5 star product." This Speaking Engagement Contract is included in editable Word format that can be customized in Word or by using the included Wizard software. How do you write a Speaking Engagement Contract document? THIS AGREEMENT is made this Current Day day of Current Month, Current Year by and between Company Name ("Speaker") and Company Name ("Customer"). Speaker is in the business of providing live speaking services for a fee. Customer desires to have Speaker render specific services (the "Services" or "Speaker's Services") as set forth in Exhibit B. Services shall be rendered on a specific date (the "Event") and according to the terms as set forth in Exhibit B. Provide to Customer a pre-event consultation, by phone or in person prior to the Event, in order to finalize specific topics or an outline of what is to be spoken about (the "Topics") as well as the speaking (the "Times"), determine the format and whether any Question and Answer periods are applicable, whether Customer desires accessibility to the Speaker by the intended audience, whether the Speaker is to perform specific tasks (the "Speaker's Duties"), to set forth any locations (the "Locations") that Speaker will be required to travel to in order to render the Services to Customer or adhere to the event schedule (the "Schedule") as provided by Customer to Speaker and agreed upon in writing by Speaker. Customer has the sole responsibility for arranging this pre-event consultation with Speaker, and failure of the occurrence of a pre-event consultation shall not constitute breach of this Agreement. Provide the agreed Services on the dates, Times, and Locations as agreed upon in the Specifications. Provide proof of agreed-upon expenses associated with the Event and the execution of Speaker's Services and present them to Customer for approval. Provide to Customer in writing answers to any questions submitted to Speaker concerning the Topics, provided those questions are received no less than 10 days prior to the Event. Agree to adhere to any restrictions imposed upon Speaker concerning Topics; restrictions that may be imposed by the venue; restrictions that may be imposed by a municipality or any other jurisdiction that the Speaker or Customer may be subject to. Speaker agrees to provide the Services pursuant to the specifications set forth in Exhibit B attached hereto (the "Specifications"). Use of Photographic, Audio and Video Recordings. Speaker will retain all rights to any and all photographic materials, and audio or video recordings made of the Speaker's participation in the event, unless otherwise agreed upon. Customer may not use, sell or distribute these materials or use Speaker's voice, speech, content, quotes or likeness in any way that could be construed as an endorsement of the Customer, the Customer's organization, company, cause or any other use without the Speaker's written permission or as agreed upon in Exhibit B. Speaker shall retain, under the fullest extent under the law, full copyright and interest in any and all recordings, film, digital files, proofs, samples, prints, or negatives created, produced or otherwise captured by the audience or Customer during the rendering of the Services. Customer agrees to return to Speaker any materials Customer may have of Speaker's, such as promotional materials, samples, recordings, artwork, mock-ups, comps, text, digital media, film, images, or any other physical or digital embodiment of Speaker's creative work performed under this Agreement. Upon termination or expiration of this Agreement, Customer agrees to be solely responsible for any additional use of materials and advertisements created by Speaker pursuant to this Agreement. Additional expenses may include, but are not limited to: Fees, licenses, translations, royalties, talent, and other associated fees. Speaker's obligation in 4.a shall not apply in any respect to foreign use. The following is to be used if you are granting rights to your Customer in Exhibit B and is to set forth the license and limitation. It is important to do this so you grant only a right to use the materials that is non-exclusive and does not call into question whether the work you performed could be considered "Works for Hire" and gives all of the rights to the Customer. Customer is granted a non-exclusive worldwide right to use the materials for Customer's own promotional, advertising, internal use or any other agreed-upon use as outlined in Exhibit B. Photos or materials are NOT to be resold or distributed to any third parties or event participants. Speaker's copyright must accompany all use of the materials whenever possible and must read "'Copyright Current Year, Credits. For all of Speaker's Services under this Agreement, Customer shall compensate Speaker in cash, pursuant to the terms of Exhibit A attached hereto. In the event Customer fails to make any of the payments referenced in Exhibit A by the deadline set forth in Exhibit A, Speaker has the right, but is not obligated, to pursue any or all of the following remedies: (1) terminate the Agreement, (2) withhold all materials, Services, and content, (3) bring legal action. If Speaker has agreed to co-sponsor the event in exchange for promoting Speaker's own organization, message, services or products, the Customer shall adhere to the requirements and deliverables pursuant to the terms of Exhibit A attached hereto with respect to Speaker's products, promotional materials and advertising. All licenses shall be revoked if Customer fails to make any of the payments referenced in Exhibit A by the deadline set forth in Exhibit A. Customer agrees to indemnify and hold Speaker harmless with respect to any claims, loss, lawsuit, liability, or judgment suffered by Customer that results from the use of any material prepared by Speaker or execution of Service by Speaker or at the direction of Speaker, which has been materially changed from the Specifications. Speaker shall not be responsible for failing to render services concerning missing any location, topics, special requests or speaking with any specific audience member or group that is requested by customer unless that request has been made in writing and agreed upon in Exhibit B. Speaker shall not be responsible for any adverse effects or the impact of such upon deliverables resulting from, but not limited to: weather, timing, actions of individuals present at any speaking location or deliverables dependent upon the actions or presence of individuals at any speaking location, transportation issues, equipment failure, access to speaking locations or anything else not under the control of the Speaker. Speaker shall not be responsible for any delay or loss of speaking time due to any action or inaction, or adverse effect that the Customer may experience that is the result of any action or inaction on the part of the Customer. Customer agrees to make available any items, hardware, or software as Customer and Speaker may agree are reasonably necessary for such purpose. Specific items and hardware or software requirements are listed on Exhibit B attached hereafter. Speaker shall have no restrictions on other professional Speakers being at the event. Customer warrants that Customer has not signed any exclusive contracts with any other Speaker or Agency that would preclude or interfere with Speaker's right to render the Services or otherwise conduct business at the event. Customer shall have responsibility for the following event deliverables. EXAMPLE: Edit the deliverables below as you see fit. A copy of official event credentials and/or any security passes required to move around event locations. A parking pass that is as close to the event location(s) as possible. Access to a secure storage area at the event location(s) for equipment and materials. Contact cell phone numbers for event staff at event location(s) who are responsible for event planning, PR or production, or for any deliverable listed on Exhibit B. A list of all requested locations and/or specific speaker duties. An event timeline or schedule that contains a list of all start/end times for each location event or duty). All event maps or driving directions to event location(s). This Agreement shall be binding upon and inure to the benefit of Customer and Customer's respective successors and assigns, provided that Customer may not assign any of Customer's obligations under this Agreement without prior written consent of Speaker. Customer shall have no right to assign any of Customer's rights or have the right to sublicense and photographs or materials to any other parties. In the event Customer fails to make any of the payments set forth on Exhibit A within the time prescribed in Exhibit A, Speaker has the right to withhold any materials, content, audio or video recording, photographic or otherwise, or to suspend any further creative or administrative Services performed on behalf of Customer until payment in full is received, plus accrued late charges of 1 1/2% per month. Customer warrants that everything Customer gives Speaker to use in fulfillment of Services is legally owned by or licensed to Customer. Customer agrees to indemnify and hold Speaker harmless from any and all claims brought by any third party relating to any aspect of the Services, topics, creative or other content, including, but without limitation, any claims resulting from missed Locations, Duties, Shots, inaccessibility to Locations, weather-related problems, inaccessibility or lack of cooperation from critical employees, staff, or other personnel required by Speaker in order to meet any of the deliverables or obligations listed in Exhibit B; difficulty in gaining any access to the agreed-upon Locations or any demands, liabilities, losses, costs, and claims, including attorney's fees, arising out of injury caused by Customer's products/services, material supplied by Customer, copyright infringement, and defective products sold via the advertising or Services. Further, Customer agrees to indemnify Speaker from responsibility for problems/disruptions caused by third-party services and contractors that Customer may use, such as reproduction services, replication, duplication, enlargements, digital processors, audio/video production services, live sound, transportation, shipping or hosting services, film processing, mixing, pre/post production services and other services that relate to the execution of the Services by Speaker outlined in this Agreement. Customer grants Speaker the right to use or otherwise reproduce the audio, video, proofs, images, creative content, description of Services performed, results of Services or testimonials as Speaker sees fit for promotional-only purposes. Customer agrees that the only damages available under this Agreement shall be limited to the total amount of compensation paid to Speaker and that this shall be the sole remedy to Customer for damages under this Agreement. This agreement shall begin on Start Date and shall continue in full force until terminated by either party upon at least thirty (30) days prior written notice. The parties represent and warrant that, on the date first written above, they are authorized to enter into this Agreement in its entirety, and duly bind their respective principals by their signatures below. 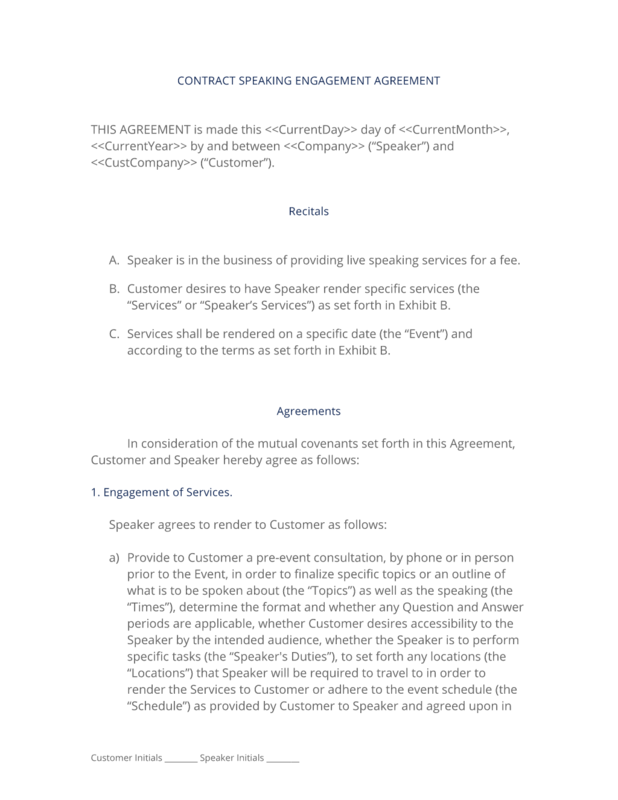 The complete Speaking Engagement Contract - with the actual formatting and layout - is available in this Contract Pack.